The coast line of Washington has been a real fan favorite for years and it offers many species of fish, marine life and scenic opportunities. It has given anglers the chance to catch a king salmon of a lifetime with lots smiles and fish for the cooler its a awesome experience. King salmon fishing off the coast of Washington is and has bean proven to be one of the best salmon fisheries on the west coast. I fish out of the Quileute Indian Reservation just minutes from Forks on the Olympic Peninsula. I have fished out of this port since I was a kid and know and respect it well. This is a fine opportunity to catch a world class king the boat record is 52lbs and when it took off the guy thought he had a big shark. I told him until we see it lets treat it like a salmon, When we finally got it to the boat a half hour later we could not believe the size and the fight this fish had in it. I troll most of the time but not against mooching for salmon, along with the great fishing the scenery is spectacular with lots of rocks, sea life, and a variety of birds. I do clean or fillet and bag the fish. 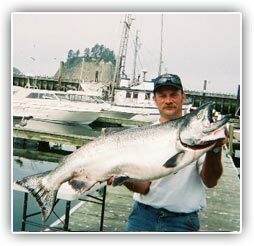 The salmon season for area 3 La Push is June 26th - Sept. 18th. Daily limit of 2 fish one may be a king salmon, with a additional pink salmon for a 3 fish possibility. We also have a week prior June 18th - 25th for hatchery kings only. Daily limit of 2 king salmon. All bait & gear will be provided. ... and a BIG cooler!